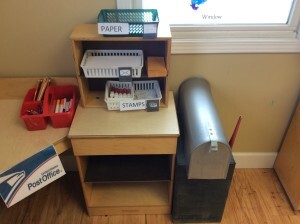 Blog | Progressive Early Learning | The Preschool that comes to You! When I was growing up my family was involved with a clown troop. I was literally raised by clowns and it does seem to explain a lot about the man I have become. It seems I jest, and I guess I do a little,but it is really true. My devotion to bettering the lives of children and my sense of humor were very much influenced by my experiences with clowns and as a clown myself. I no longer dress up as a clown but I do work with children. 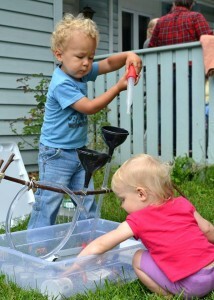 For the most part my work with children has been about the role of play in children’s learning. Recently the leader of the clown troop passed away and I have had a bit of a shift in my focus as a result of reflecting on his life. My friend Tom, AKA “Uncle Cabin” lead the clown troop. He was a mixed bag of a man so to speak, but he devoted his life to bringing joy to people especially kids. When he passed it really got me thinking and reflecting. When I was involved in the clown troop that was my focus as well. But over the years I lost that focus, pivoted toward teaching, and children learning, and I also struggled with a loss of personal joy. When I read a blog from Peter Grey entitled “The Decline of Play and Rise in Children’s Mental Disorders” and his book “Free to Learn” I realized a great need for increased joy in our society,culture and in each of us. In a lot of his writings, he lays out research that has been conducted since the 1950’s about how the amount of time children have spent in self-directed play has decreased dramatically since then. There has also been a dramatic rise in childhood mental disorders, especially ADHD,Anxiety/Depression, and Narcissism. 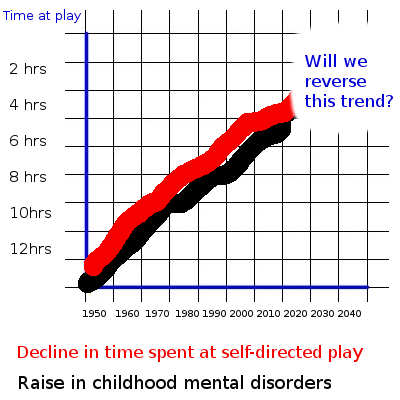 The rise in childhood mental disorders since the 1950’s and the decline in time spent at play,seem to have an exact correlation. This leads Peter Grey and other prominent psychologists and researches to believe that this correlation is so strong, that we might as well consider it almost“causation”. 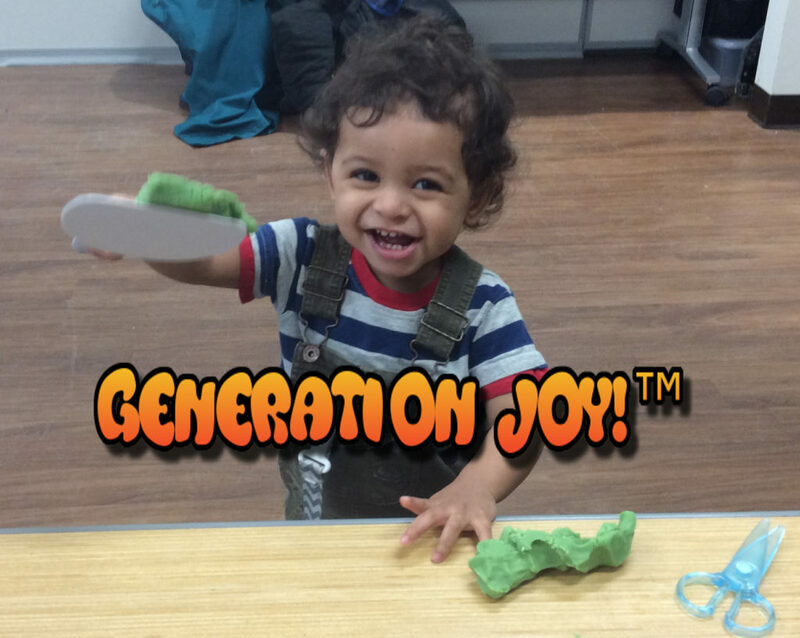 This along with the work of researcher Jaak Panksepp, about play, the brain and joy have lead me to believe very strongly that it is time we raise Generation Joy! Her eare some disturbing statistics from Peter Grey. Approximately 85% of young people today suffer from Anxiety and Depression, on a scale greater than the average scale of the same age group in the 1950’s. Since 1950 the US suicide rate for children under 15 years old has quadrupled, for 15 to 24 year olds it has more than doubled. More than 21 million prescriptions for stimulants are written each year mostly for kids 6 to 14 years old. That is a 400%increase from a decade ago. Anti-depressant use has risen 333% over the past decade as well. In the 25 years from 1982 through 2007,levels of narcissism rose significantly. By 2007 nearly 70 percent of college students scored higher in narcissism, during testing, than the average college student in 1982. Sad news indeed! There is good news! 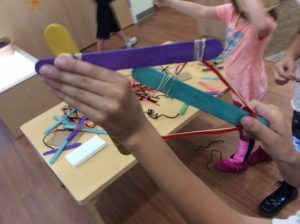 Many researchers, and developmental psychologists now believe, due in part to the work of Jaak Panksepp on the connection between joy and play, that we can solve this problem by allowing children more time to play. Some of these same people even go so far as to say that most childhood mental disorders could be straight up cured, or at least become non existent, if we allowed children more time to play independently. Some even say that ADHD is misdiagnosed most often and should really be called “Play Deficit Disorder”. I’m convinced! I see children really thrive, and see them full of joy,when they are allowed to play with little to no adult interference or direction. I see them learn more from their own exploration and repetitive processes, than when adults try to drill academic information into them. I see them excited to learn when they are allowed to simply play and play the way they want to. Since each generation has become increasingly more depressed, anxious, etc…I say we reverse this trend, and allow way more time for play. Then we will successfully raise Generation Joy! 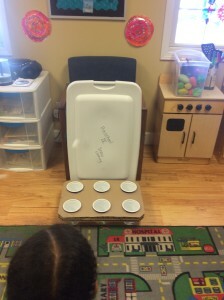 Recently I provided my coaching service for a local child care program. Two new staff members were hired as a teaching team in a preschool classroom and I was there to train and coach them. They had inherited a class of very rambunctious boys (only 3 girls in the class of 15), many with severe and moderate behavioral issues. The children mostly enjoyed running around the classroom, roughhousing and jumping off of furniture. Over the years I have worked with very difficult children, but I have never seen a higher concentration of children with these behaviors all together in one classroom. This was going to be a challenge! I was up to the challenge and so were the new teachers! We started out by establishing a schedule and routines to bring some structure to the children’s day. We discussed and implemented activities that we could tell interested the children. Through my coaching, the teachers progressed and became more and more adept at providing materials and activities that captured the interests of the children. We discussed and implemented strategies for managing the many difficult behaviors, and managing the learning environment. By following each staff member around and making suggestions, in the moment, of what they could do to improve upon any given situation, they quickly learned what was effective in each situation. The teachers took on my suggestions with zeal and ran with it! They were able to establish their own authority with the children while also establishing positive and caring relationships. They were able to implement a developmentally appropriate and educational, child-directed program. 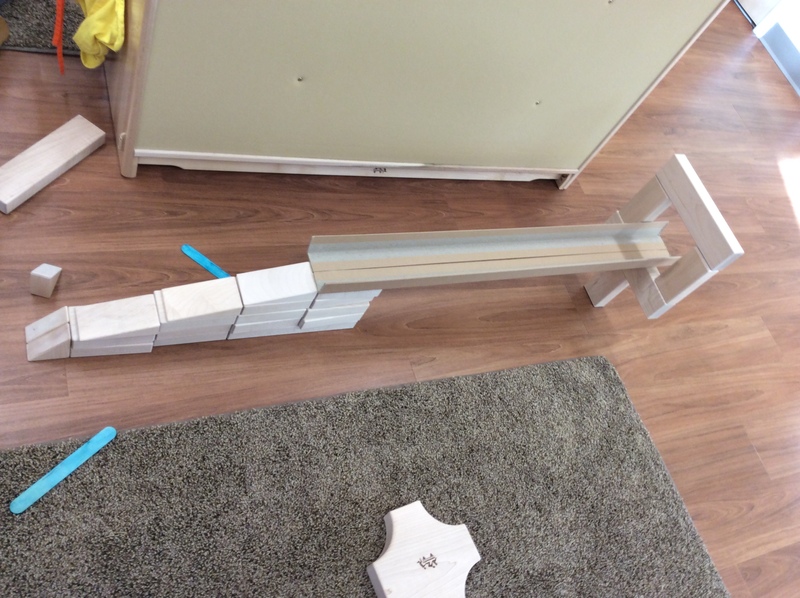 It took some time, but the behaviors and the program itself improved dramatically! I was fortunate enough to have had some coaching from Lisa Murphy “the Ooey Gooey Lady” years ago when I was a fairly new teacher, and now I am able to pass on what I learned from her and my years of experience, in the same manner. The benefit of having someone right there in the moment, coaching and training, better prepares you for every situation that may come up in the classroom. It was a wonderful learning experience when I was coached and also wonderful to pass on what I have learned by coaching others. The teachers are still hard at work implementing everything I was able to pass on to them and finding success! This post is a repost of a great blog on fix.com. I thought I would share it, enjoy! It is a disappointing thing to see new playgrounds developed in city spaces sit there empty each day, or to walk in the park and hear no laughter. What is missing here is not the children per se, but materials and environments that create challenge, imagination, and creativity that make children want to play outdoors. The absence of such play environments is not only influencing the quantity and quality of children’s play, but also affecting children’s health and well-being. As adults, we need to support children in learning to enjoy what free play in the outdoors has to offer. We need to inspire imaginations, creative minds, and capable bodies. To do this, we can look toward two simple things: nature and adventure. What’s Happening to Children’s Play? Outdoor play is a necessary part of children’s development and is considered essential for children’s play and learning. Playing outdoors provides unique opportunities for learning that the indoor environment cannot offer. For example, children engage in higher levels of creativity, imagination, inventiveness, physical activity, language, and curiosity. Most importantly, they are given the opportunity to play freely. Despite this knowledge, outdoor play has been steadily decreasing for North American children. 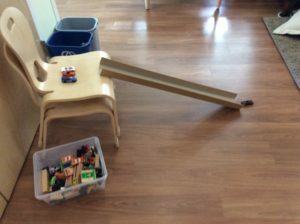 When we look at why this disappearance of free play is happening, we realize that there are many factors that contribute to the lack of play. 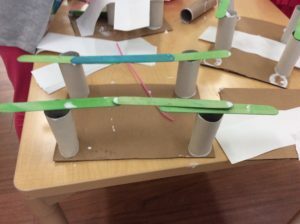 There are increases in structured play activities, an emergence of technology-based play objects, higher concerns related to safety and risk, adult control over children’s play activities, academically oriented schools, and an overall disregard for the value of play. More often than not, we see children engaged in a summer filled with structured sports activities or stuck inside with gaming systems and cell phones. 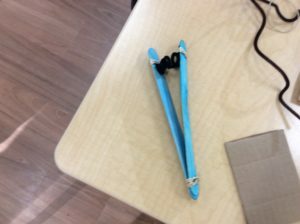 We hear adults saying “don’t pick up the sticks!” “don’t go too far!” and “be careful!”. We know that schools are decreasing recess time or taking it away all together. Unfortunately, it is all too common that today’s society has an overall disregard for the value of play and how important it is for children of all ages. 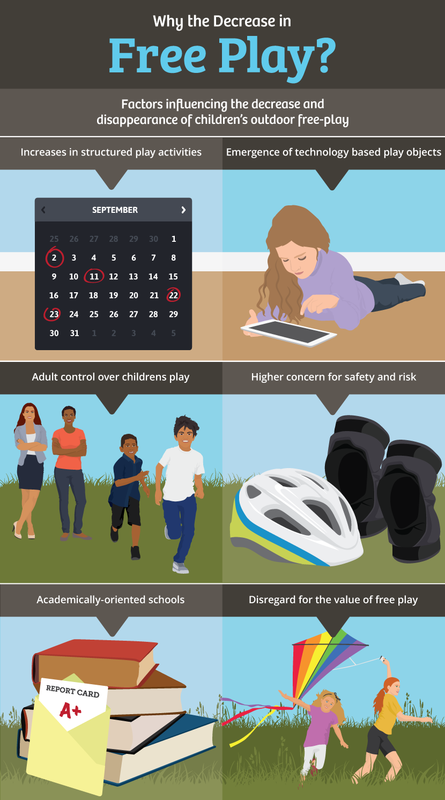 It is ultimately these factors that are placing a barrier between children and their right to play freely in the outdoors. The inability to cross over this barrier is affecting children in many areas of development. For example, there are increases in anxiety and depression at younger ages as well as difficulties with emotional regulation and self-control. Increases in physical conditions such as diabetes, obesity, and asthma are becoming more apparent in young children and childhood disorders such as attention deficit hyperactivity disorder and obsessive-compulsive disorder are more frequently diagnosed. 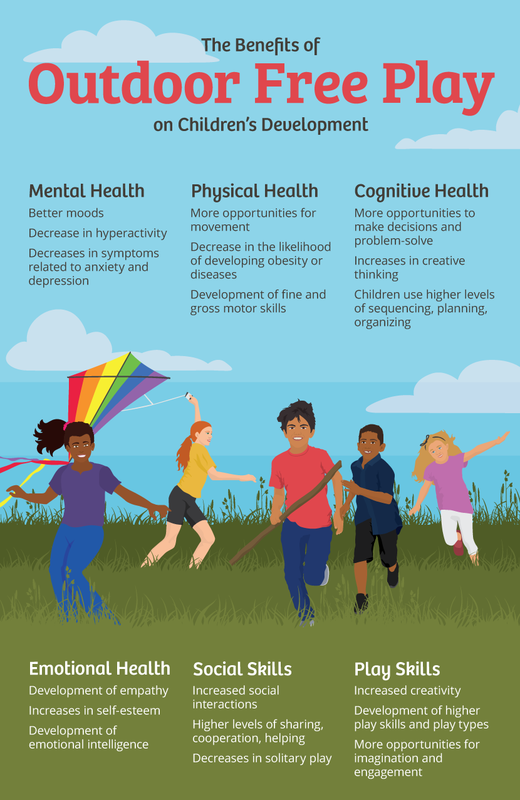 Children who do not have access to outdoor play will miss out on the many benefits that free play in the natural environment has to offer toward their growth. When children are engaged in free play in the outdoors, they are provided opportunities for freedom, choice, and fewer routines. 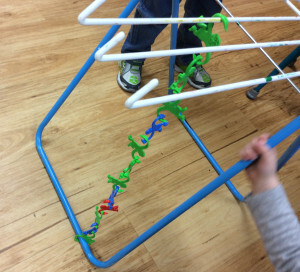 In free play, there is no adult direction or control, so children are able to play how they want to play. When children are given such freedom to play, they are more likely to engage in higher levels of social interaction, cognitive skills such as decision-making and reasoning, empathy, and physical activity. In turn, they are less likely to become inattentive, anxious, or depressed and unhealthy. The outdoor environment in particular has many benefits. A natural green space allows children to continuously explore ways to use materials, discover the varied environment, and create their own play experiences. The outdoor environment is not a man-made area and, therefore, is diverse and timeless. Children who play outdoors have heightened senses and emotions from the ever-changing topography and the rich stimuli that a natural space affords. This is how children learn – through experience: by seeing, feeling, touching, and hearing. 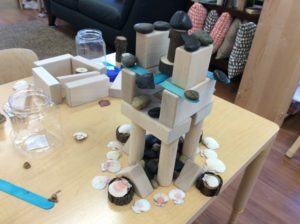 The outdoor environment is a blank canvas on which children are able to place their own thoughts, wonders, and creations. So what can be done now? After this discussion of the importance of free play in the outdoors you may be wondering how you can bring back play for children in your life. There are two things to support you in doing so: nature and adventure. What you are going to need to do is reintroduce adventure back into children’s outdoor play. To accomplish this, you can use loose parts. 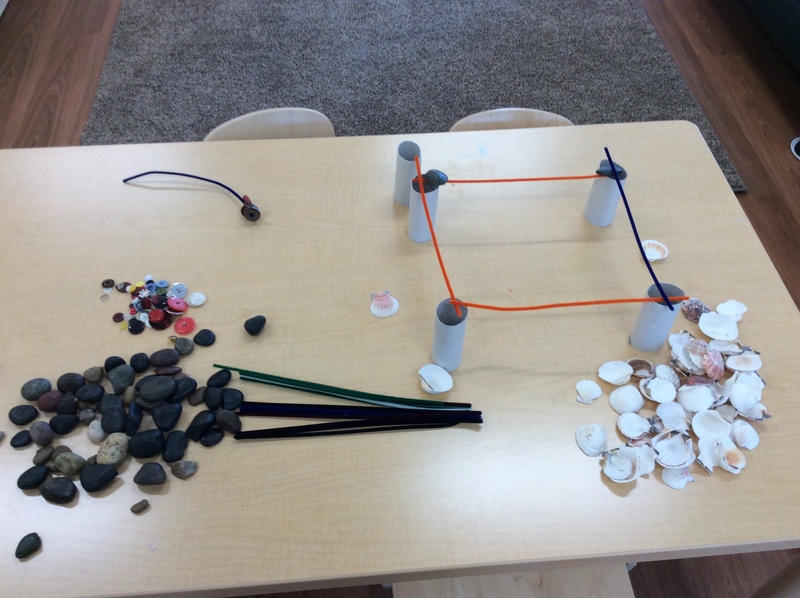 Loose parts are play objects and materials that are open-ended, manipulative, moveable, and non-dictated. This means that children can use the materials in a variety of ways and there is no suggested way or “story” behind these materials. 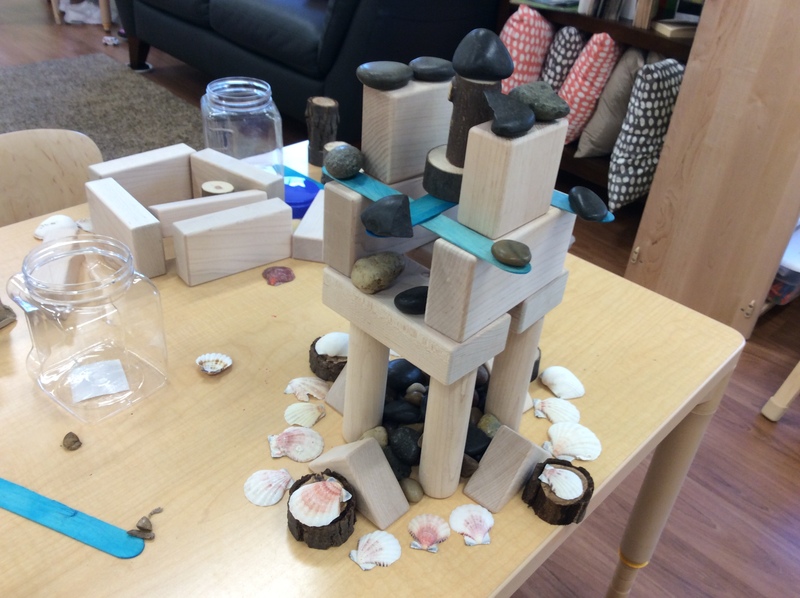 Loose parts allow children to act upon their environment the way that they want, rather than their imaginations and creativity being predetermined by the materials. 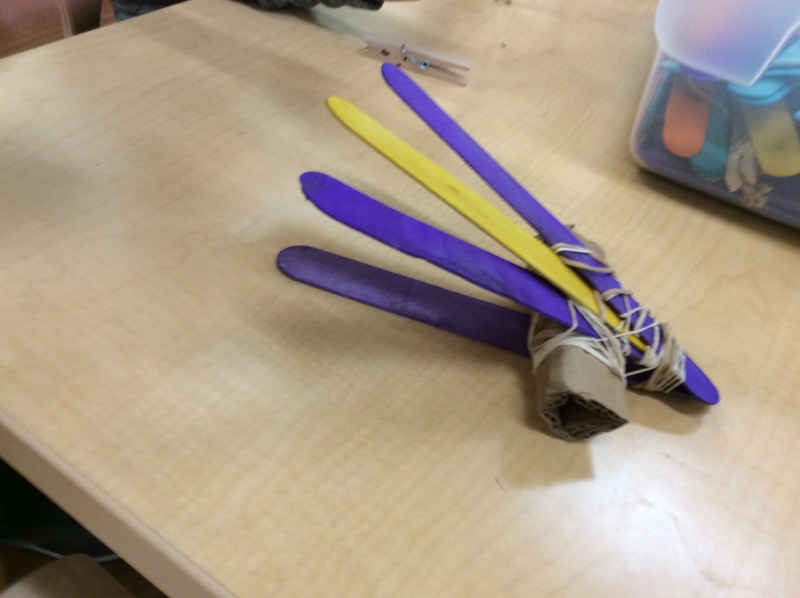 Examples of loose parts are items such as tires, logs, sticks, fabric, rope, and rocks. 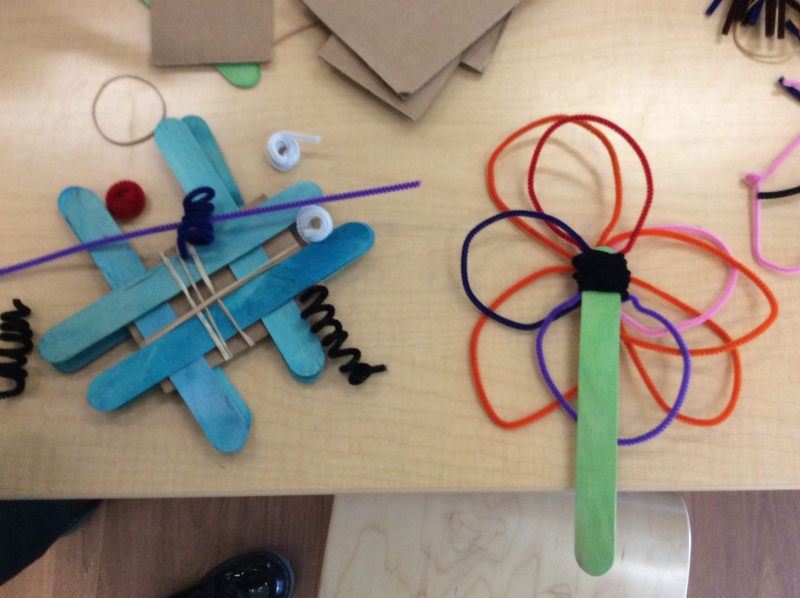 Loose parts can either be synthetic materials or materials that are commonly found in a natural outdoor environment. 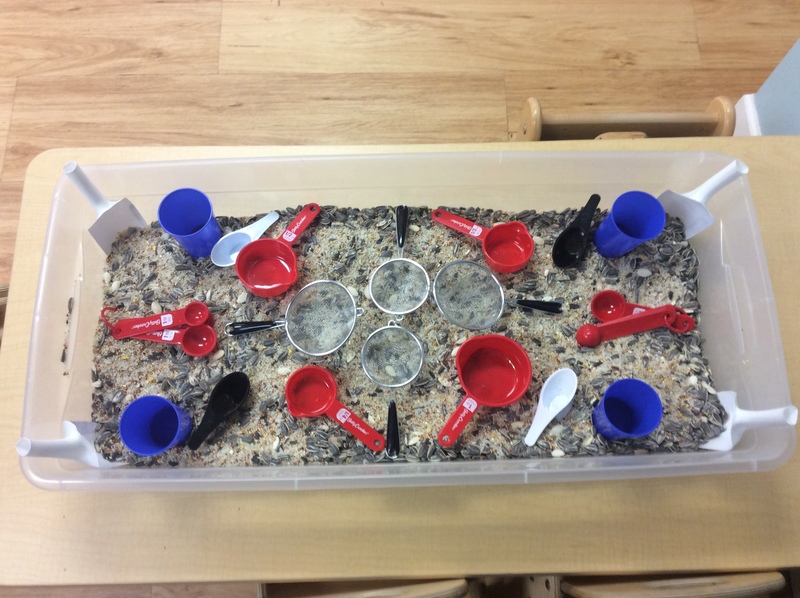 Loose parts spark children’s curiosity, which then leads to exploration and discovery. 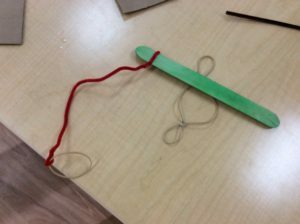 For example, if a child is provided with rope, tarp, and wooden pieces, she will become curious about what the materials are and how to use them. 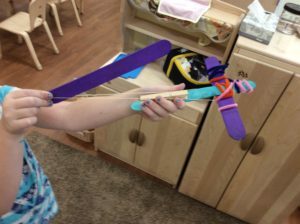 She will then begin to explore the materials in different ways through her imagination and creativity. 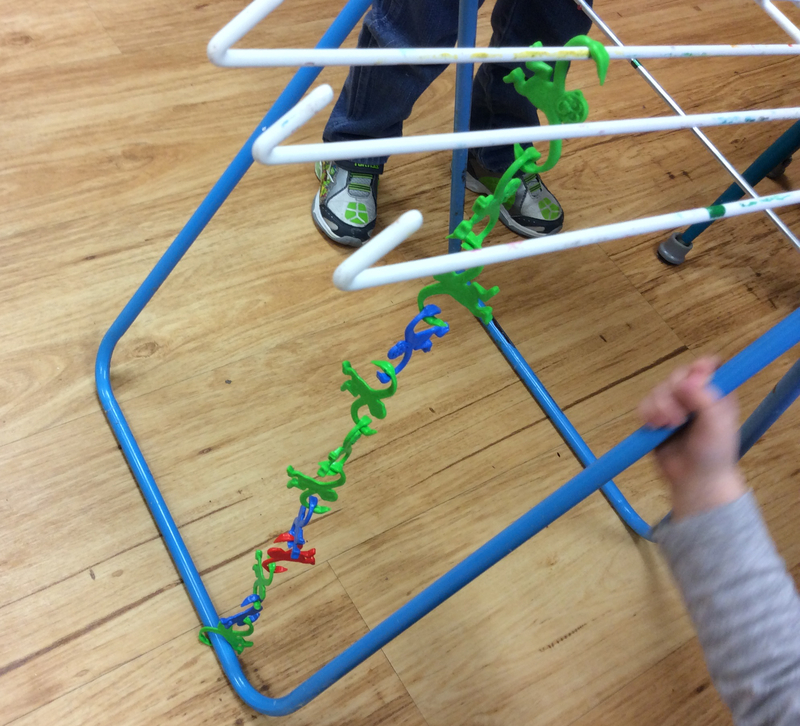 This leads to discovering that the materials can do many things. 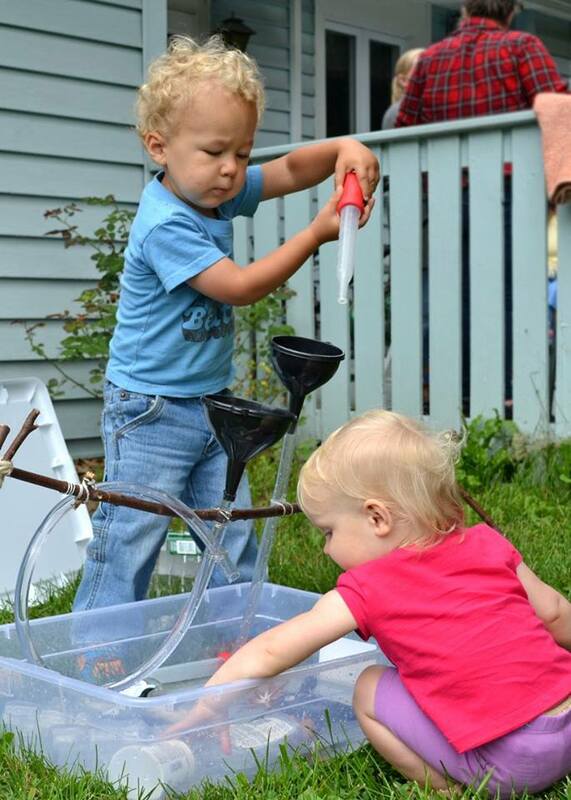 This process of curiosity, exploration, and discovery is ultimately what leads to play and learning. 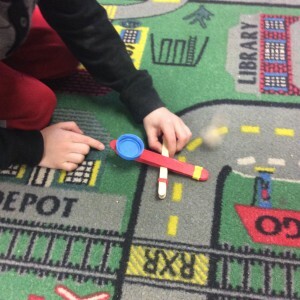 Where Can I Find Loose Parts? 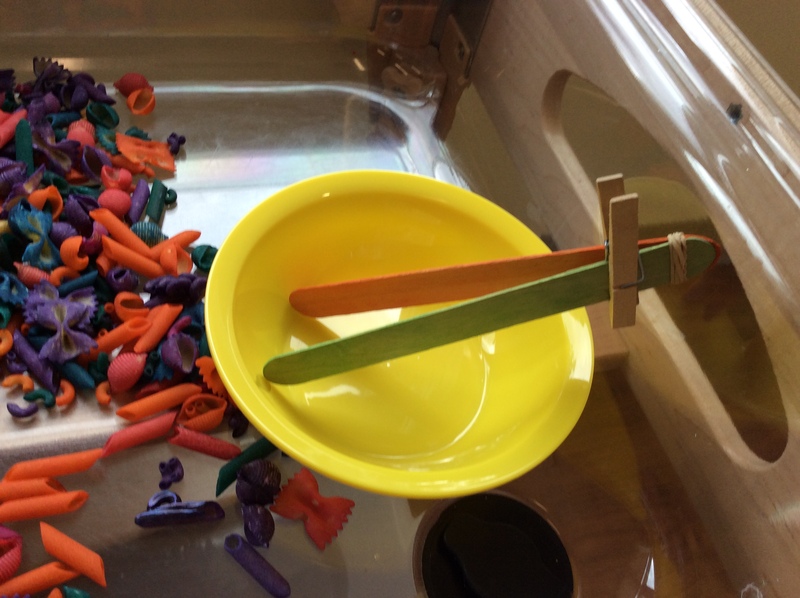 You can find loose parts in many places, and they are often free! 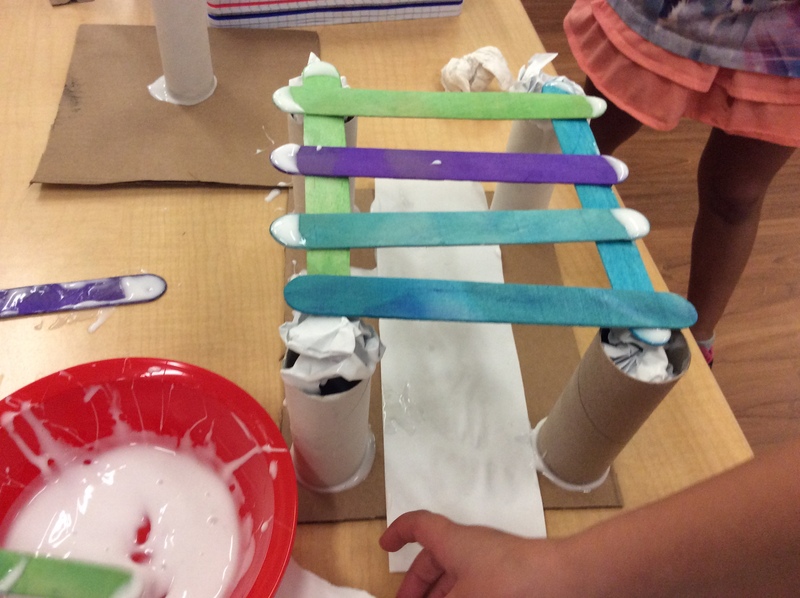 To support children in loving play again, it is important that we create environments and include materials that are fun, engaging, and challenging. If an environment or an object is too easy, children will view it as boring. 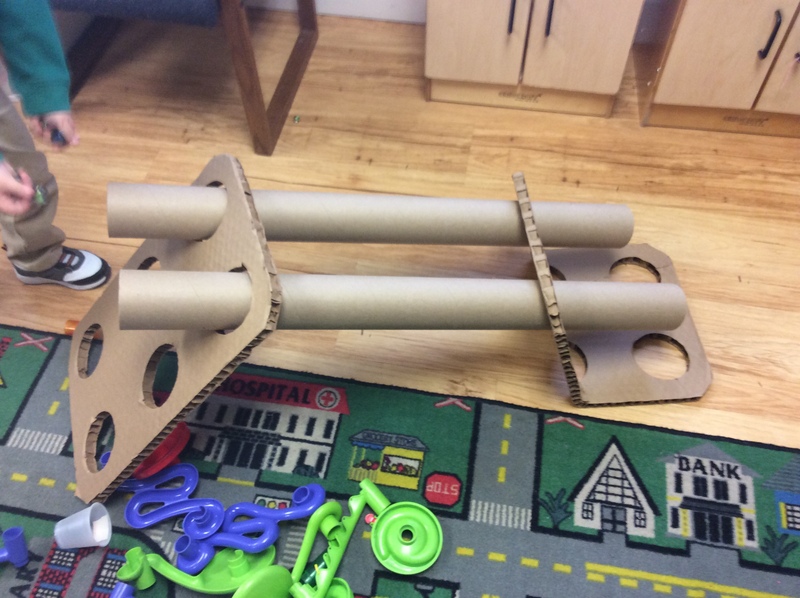 To reintroduce adventure and free play to your children, consider using loose parts. 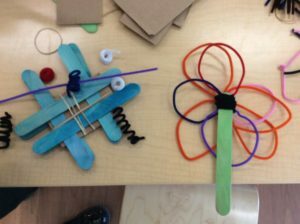 When loose parts are paired with the outdoors, it will lift children’s spirits, make them love playing again, and ultimately make them happier and healthier. A local Child Care Center Director contacted me to act as a mentor to some newly hired school age program staff. The Director shares my philosophy and approach to caring for and educating young children and trusts me to help put the new staff on a good foundation. 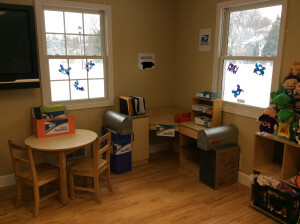 These staff members are new to the field and this is their first job in a child care center. I was to focus mostly on implementing developmentally appropriate and evidence based practice, staff interactions with children, and upholding the center’s philosophy and implementing its practice. As is my common practice I began by observing and recording what I observe. This allows me a good starting point. I began working with the staff on implementing the center’s philosophy and practice. This center is determined to provide a stress free, no pressure oasis for these children after a highly structured and demanding day at school. I worked with and spoke with them about providing unstructured time for the children to relax, play, read, do homework, explore, etc… after their busy, strict, and structured day at school. To provide a relatively stress free environment by severely limiting any demands they may have for the children. To say “Yes” as often as possible, and that the children should not be “required” to do anything, and allow for them to do what they want (within reason, i.e. not running on tables, throwing blocks, etc…) as long as they are not hurting others or destroying things. We also discussed and I modeled many examples of ways to provide stimulating, developmentally appropriate materials and activities, with a “provocation”. 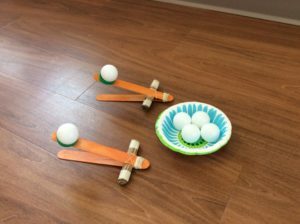 This allowed the staff to see firsthand the first rule of behavior management, to keep the children happily engaged in play, by following their interests and abilities. Now when the children arrive, they are invited into the classroom and can unwind by eating a healthy snack, read in a cozy location, or just relax. 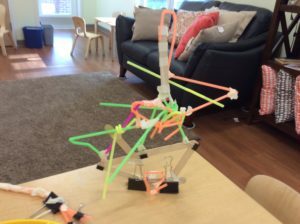 They can do homework in a space offered to them for that purpose, or play and explore the materials provided in the classroom. The environment is relaxed; there are no demands or requirements and no pressure. Just what the children need! 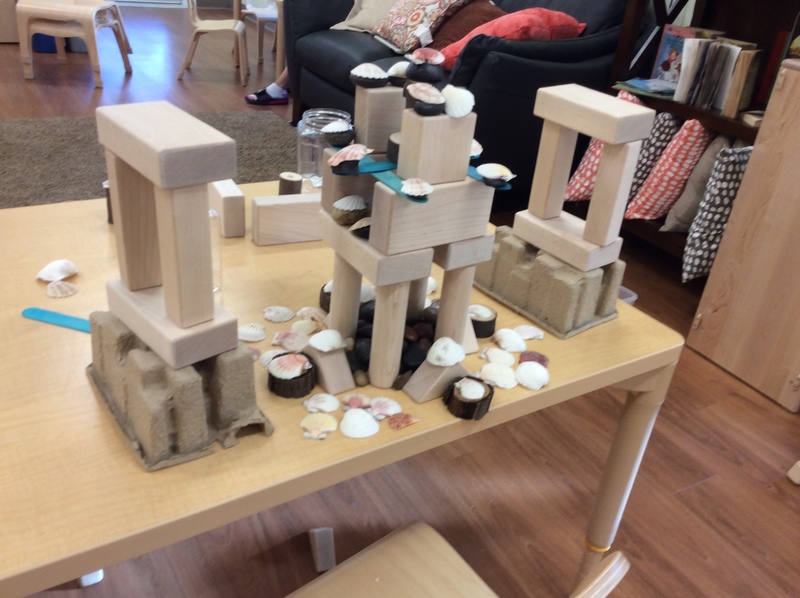 I provided some examples of stimulating “provocations” in the manner of the Reggio Emelia approach and showed how the children can be inspired in their play. 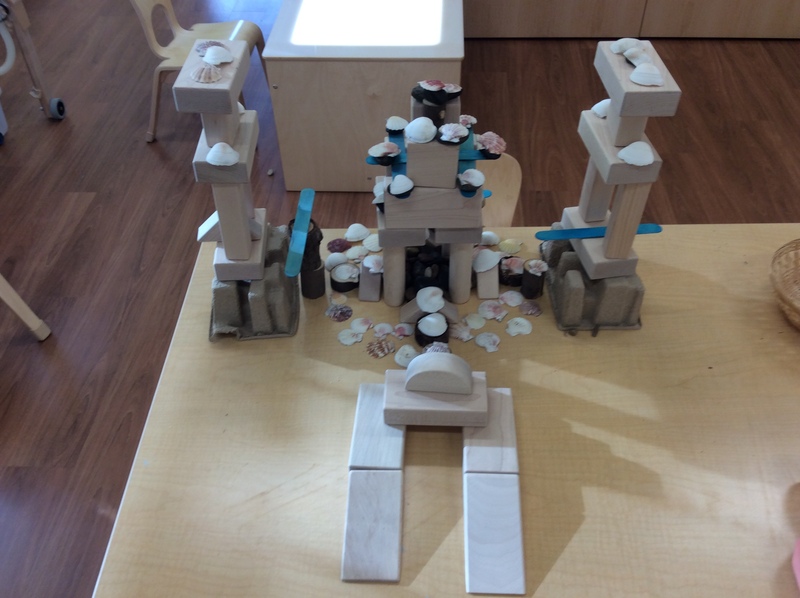 I set up this simple provocation with tree blocks, blocks, craft sticks, cardboard inserts, shells and stones. 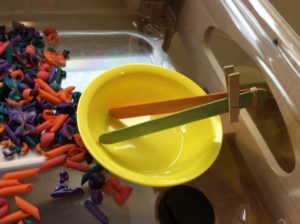 The children came in to the classroom and many of them immediately came to the table and creatively used these materials. 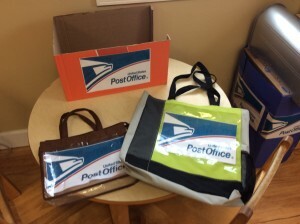 Below are some examples of their use of the materials. I also set up other areas of the room to show the teachers how each area can be set up to stimulate play and exploration. The children enjoyed racing cars down the ramp, then they “improved” the design and experimented with different blocks and ideas about how to make this even more fun. Below is some of what they did. 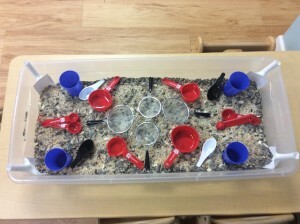 I made some shovels out of milk jugs for all of the sensory bins in the center. 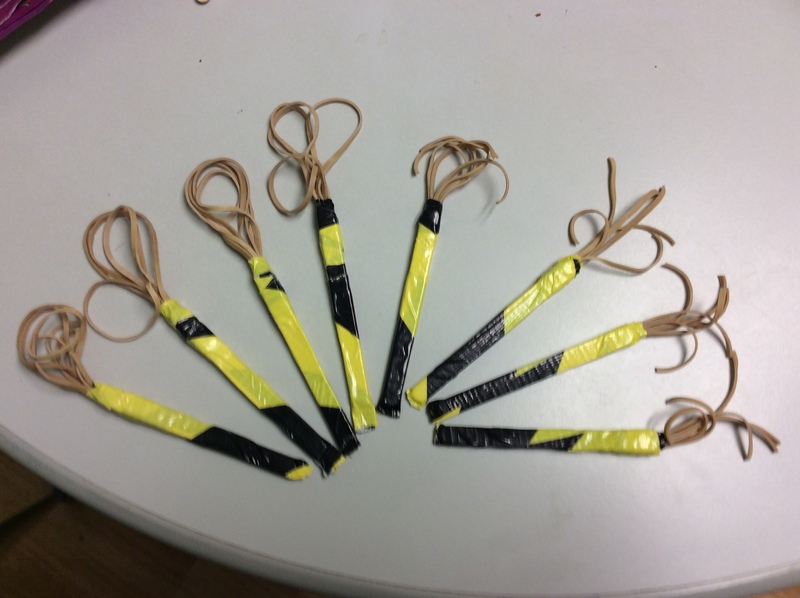 For the school age classroom I made some simple tongs and catapults out of craft sticks, rubberbands, cardboard, milk tops, and clothesline clips. As the children came in that day they saw me making the catapults and were inspired to create their own, improve on my design, and to even create their own “things” out of the materials. 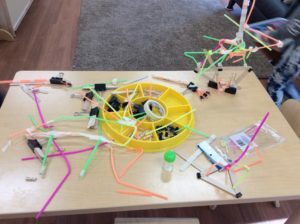 This gave the staff an opportunity to witness how children, being engaged, following their own interests, and just plain having fun, leads to a peaceful environment, where the children can learn and succeed. 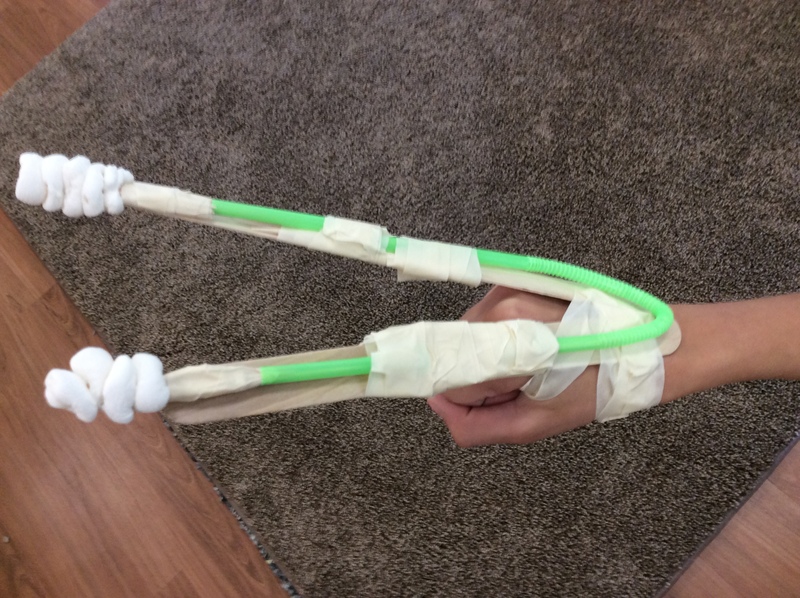 One child improved on my catapult design to make a “triple catapult”. 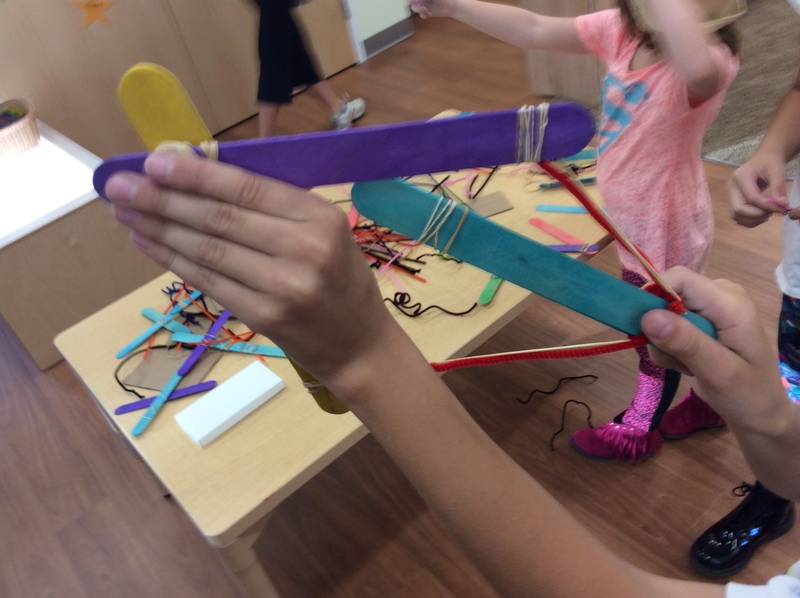 Their creativity and experimentation soared! 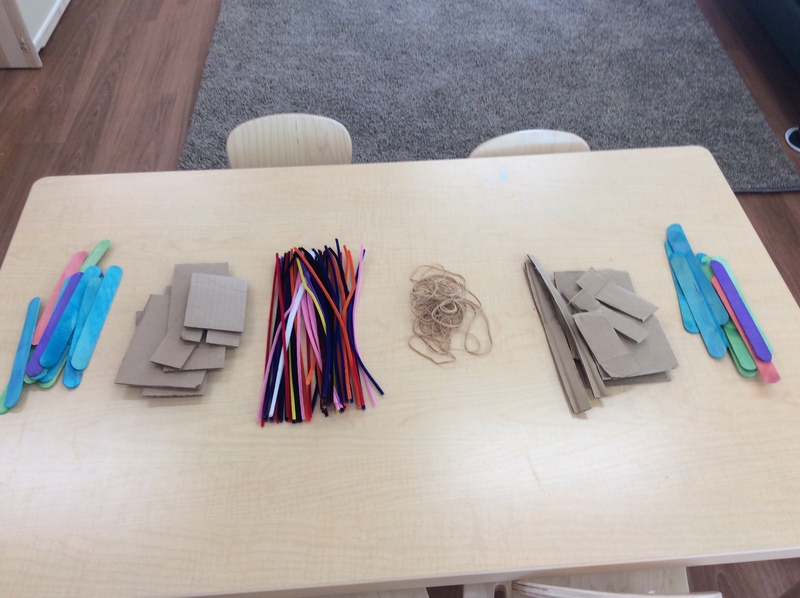 These materials were out for several days and the children loved it and created many of their own “things”. Below are some examples. Three of the children designed and created working bows and crossbows! 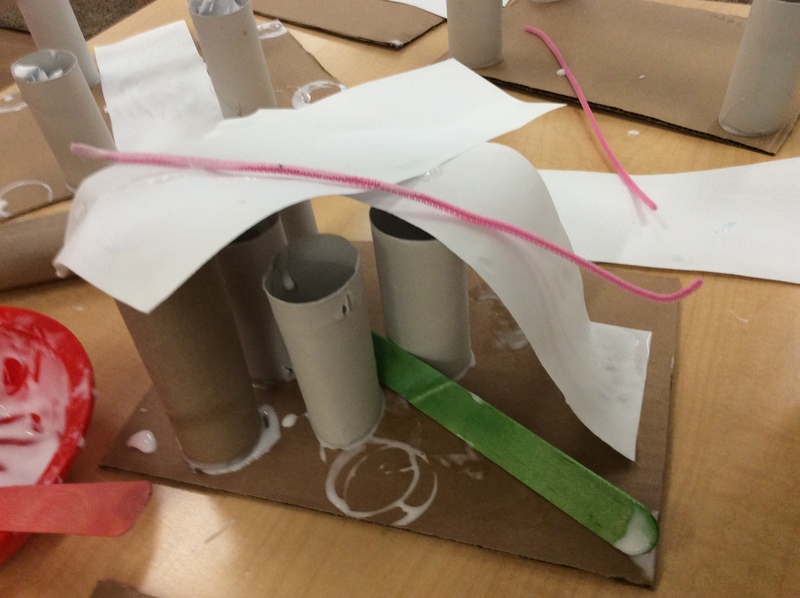 One day the teacher set out cardboard, toilet paper tubes, and bowls of glue. This was intended to be a paper mache’ project. 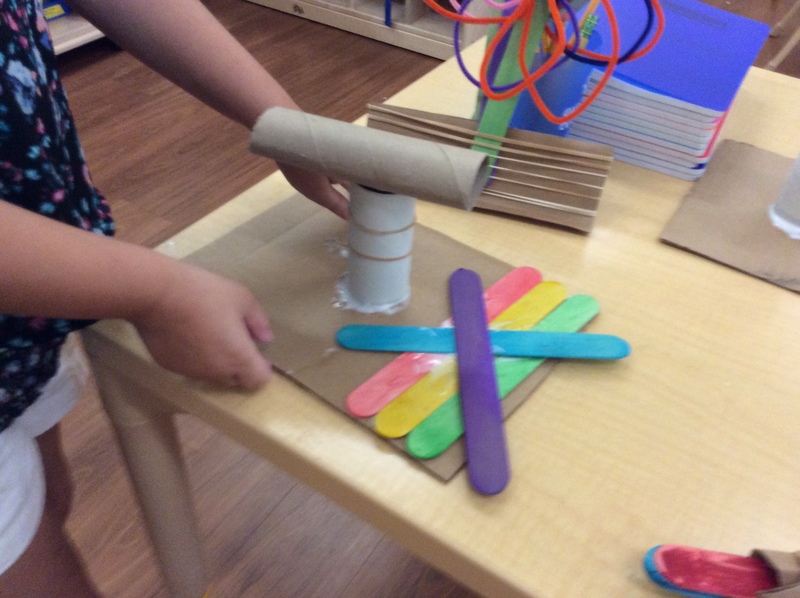 The children then went over to the other table that we had set up for a few days, and brought some materials over to use all of them together. This experience I used to speak with the staff about process oriented, open ended, art. 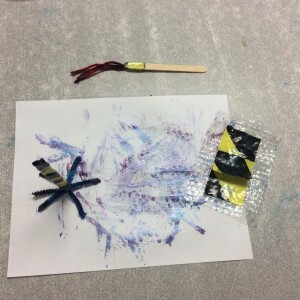 The children were so creative! I believe that the teachers witnessed the children at their happiest and at their best! 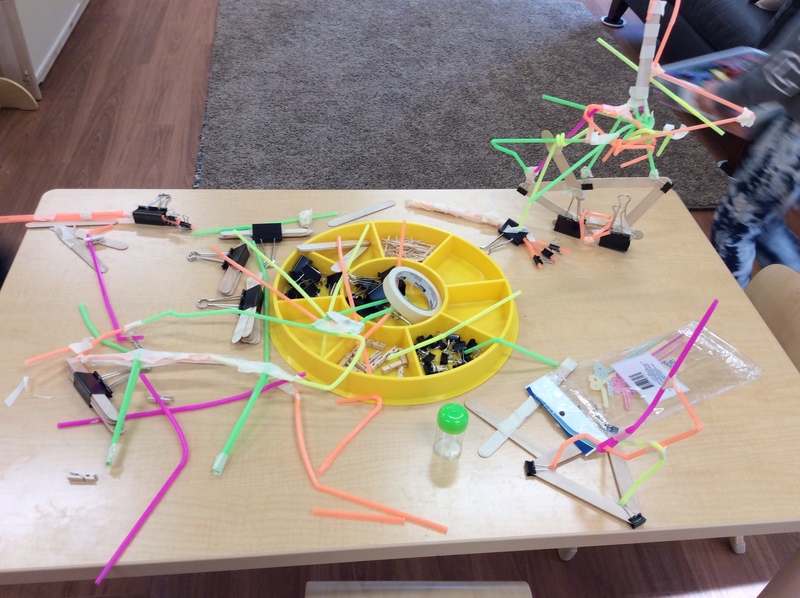 They were able to see the creativity, and problem solving skills being used by the children. They were able to see the children experiment and work out their own learning process through trial and error. 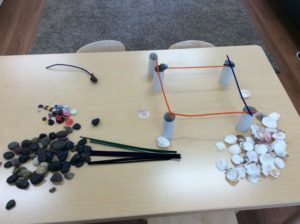 They then embraced the vision and I tasked them with setting up the table with their own provocations. One teacher set this out. Here is just one example of what the children did with the materials. 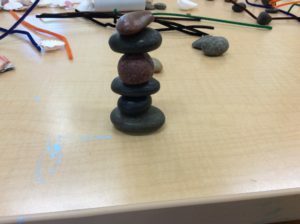 Stacking stones takes some serious patience and fine motor skills! 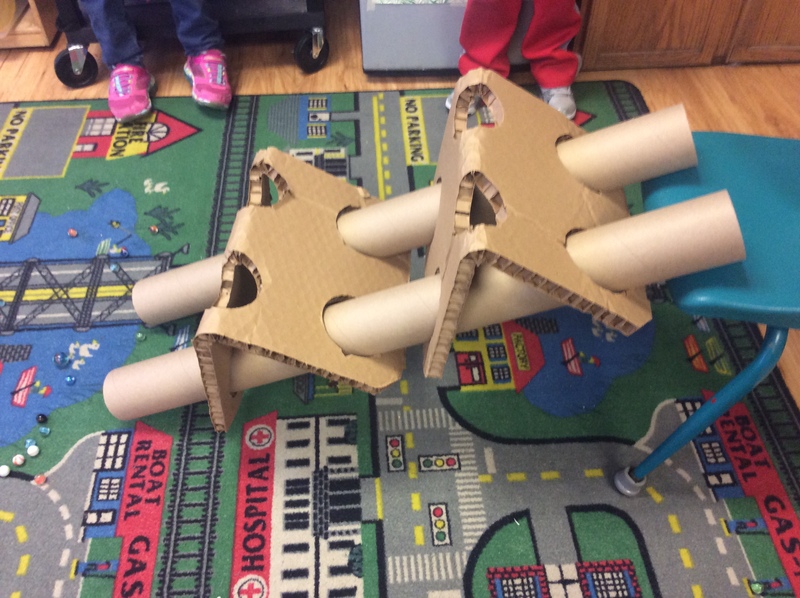 These children persisted and succeeded! 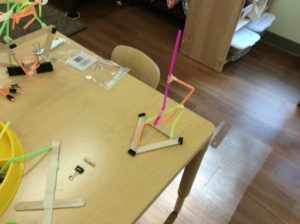 Another day a teacher set out straws, tape, craft sticks and a variety of clips. Below is some of what the children did with the materials. Throughout this entire process I also addressed developmentally appropriate and evidence based practice, child/adult interactions, and behavior management techniques with the staff. I spoke with them about modeling the behaviors that you would like the children to exhibit, and through that, will you earn the respect of the children and build relationships with them. I spoke about “embracing the chaos”, meaning that often what adults perceive as “chaos” is really children having fun and expressing joy, and how we need to allow for that. I also spoke with them about appropriate interaction, communication and discipline with the children. I was able to model all of this as I was always right there in the classroom with them as a part of their teaching team. I worked with the staff on positive interactions with the children. I spoke with them about the 3 R’s, relationship, responsibility, and redirection. I modeled and spoke about maintaining a soft tone of voice. Speaking softly, but firmly, and with finality and conviction. Getting down to eye level while speaking to children, and remembering to use positive physical contact, with boys especially, while speaking to them in a disciplinarian way. I also worked with the staff and modeled using positive language phrasing such as “you may throw balls, but not blocks”, and “save your running for when we go outside, please walk inside”, etc… We talked about using “If/then statements” with the children, giving a five minute warning before transitions, and strategies for getting the children’s attention, lining up to leave the room, and what to do when children yell and hit the teachers. I also shared with them about being intentional and responding to children not reacting to them. I worked with the staff on helping the children with their social skills. The teachers’ primary role in this is to help facilitate conversations between children, especially during conflict. 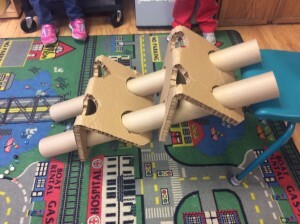 I recommended that they remind the children to use the name of a child that they are trying to talk to, and to be specific and explicit about what they want the other child to do or stop doing. I spoke with them and modeled allowing the children a reasonable amount of time, during a conflict with peers, to work it out on their own. Give the children a chance to solve problems together as you facilitate the discussion between them. Teachers can use “active listening” skills with the children and “I statements”. Ask them open ended questions like “what can we do about this problem?”, “what do you have to say to___?” I shared about why it is not appropriate to force children to apologize, allowing “natural consequences” to teach them how their behavior affects others and the environment, and about how solving problems for the children robs them of opportunities to work things out among themselves and learn valuable skills. And so much more! This was an amazing experience and I believe that I successfully laid a good foundation for these teachers in this wonderful program. I look forward to working with the staff at this center again! This article appears in the June/July 2016 issue of “The Wedge” newspaper. The newest article of my regular column for that paper. Adventure playgrounds have been around for about 75 years, mostly in Europe. In the U.S. a movement to promote and create adventure playgrounds is just beginning to take hold. A landscape architect from Denmark in the 1930s and 40s noticed that children weren’t playing on the playgrounds that he designed. He noticed that they played everywhere but. After WWII, children were found playing in the rubble of bombed buildings, and the construction sites of rebuilding efforts. Some people decided to create spaces similar to the rubble and called them “Junk Playgrounds.” This idea took off in Europe in the latter half of the 20th century, and someone had the sense to rename them “adventure playgrounds.” Now there are over a 1,000 of them in Europe and a handful here in the US. Why are adventure playgrounds so popular with children? Oh, I am so glad that you asked! A google search will give you a pretty good idea. 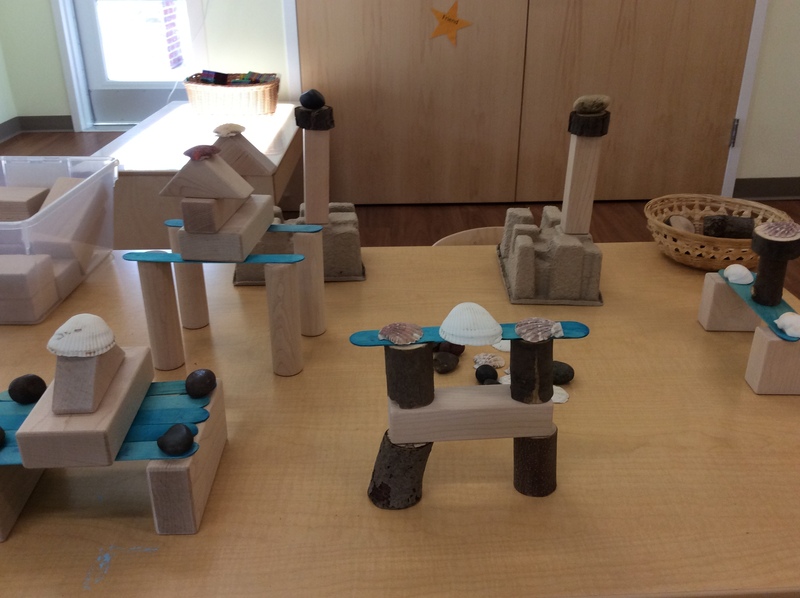 They are dirt-filled, often muddy lots, filled with loose parts, planks, pallets, spools, tires, rope, swings, slides, tools, etc. Often they are seen with a variety of “graffiti” and paint everywhere, and with trenches (often dug by the children) filled with water for more fun. Some are even seen with fires blazing. A recent documentary called “The Land” features an adventure playground in Wales. It is runs around 30 minutes long and in it you see children climbing and building, swinging and collaborating. You even hear them cussing and see them light things on fire. This film also shows how this is all happening under the supervision of “play workers.” These play workers are adults that have an unobtrusive presence on the playground and only intervene in the play of the children if they are invited or in case of possible serious injury. This idea might sound scary for a lot of American parents. But children love it! Children love the thrill of adventure, risk, and perceived danger. Children love the freedom to explore, discover, take risks, socialize on their terms, build things, and navigate perilous ground, but most of all, play without an adult hovering about. They feel empowered, learn to assess risk, and gain mastery over their bodies and independence in their souls. They become more confident in their abilities and feel pride in their accomplishments. 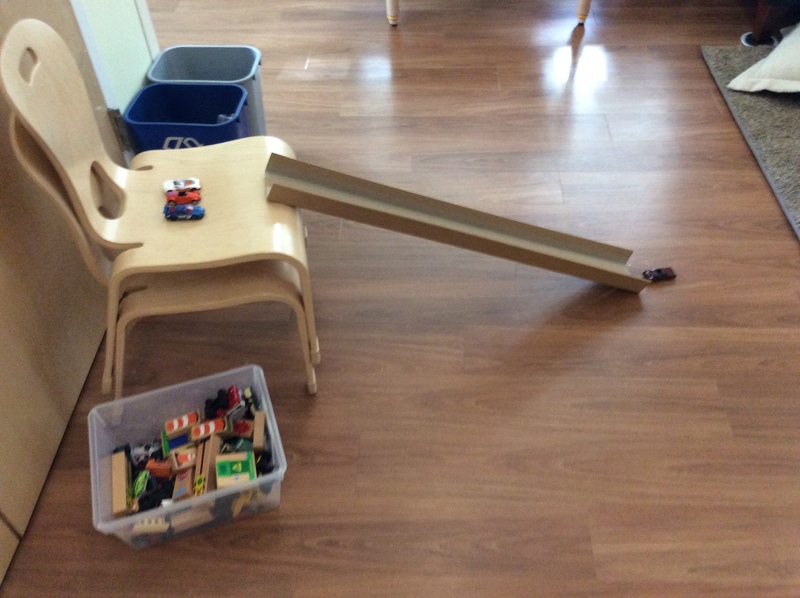 If you’ve read my articles or blogs about “Risky Play” and “Loose Parts Play,” you will understand more about why children need and are drawn to this type of play. Speaking of Rusty Keeler, he has created an adventure playground in Ithaca called the “Hands on Nature Anarchy Zone” in the Ithaca Children’s Garden. He also designs and creates play spaces for a living through his business called “Earthplay Design” also in Ithaca, NY. One of the goals of my business, Progressive Early Learning, is to help bring an “Adventure Playground” to the Rochester area. If you or someone you know is interested in helping with this effort please contact me. Let’s get outside and play! Drew Beeman is founder and director of Progressive Early Learning. For more information about learning through play and about Progressive Early Learning, visit www.ProgressiveEarlyLearning.com. This article appears in the April./May 2016 issue of “The Wedge” newspaper. The newest article of my regular column for that paper. In my work with Toddlers I find that the three “R’s” of early care and learning are very important. They are Relationship, Responsibility, and Redirection. I also find that it is very important to understand their needs, desires, and challenges. I love my job and chosen career, and I delight in watching these little ones explore their world, and discover the inherent magic in it. Well not magic really, but to them it may seem like it. We adults must remember and never forget what it was like when everything was brand new to us. Young children need secure relationships with the adults in their lives. They need to form attachments with their caregivers. It can be difficult to hand your baby over to others, knowing they have that with you, their parent, but they must form an attachment to their caregivers in order to feel secure in the learning environment. The studies have shown that children need this, most of all, in order to learn, and thrive. Children need to learn to be responsible as well. I only have three rules or guidelines, they are “be as safe as necessary, people are not for hurting, and things are not for breaking”. We teach them responsibility and independence as we guide them through self help skills, and teach them that people are not for hurting, and to take care of their things. I like to use the words “responsible choices” and “irresponsible choices” when it comes to discipline. I make no moral judgments with terms like “good” and “bad choices”, knowing that these little ones are not bad when they hit, they are just doing what toddlers do. Remember Bam Bam from the Flintstones? He is the perfect depiction of your typical young toddler. That brings us to our next point. Redirection is the name of the game when it comes to discipline. Discipline is really teaching. “I cannot let you hit your friends but you may hit the pillows”. “You may not pound with our chalk and crayons because they will break, but you may go pound with the hammer and hammer bench”. “You may not throw blocks it could hurt someone, but you may throw the balls”. Do you see how this redirects them to make responsible choices while passing no moral judgments? I know toddlers need to pound, and hit, and throw, and run, and climb, etc.. that is developmentally appropriate behavior for toddlers. I need to provide a safe environment for them to be toddlers and do what toddlers do. I love to provide toddlers with developmentally appropriate experiences that are diverse, meaningful, and relevant. But also just plain fun! I love creating environments where they can explore, and experiment, and discover as much as possible what the world has to offer. 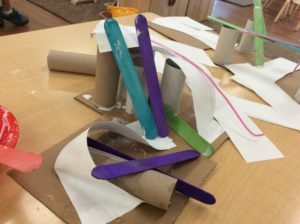 The three “R’s” set the stage for this exploration, and the freedom to play and explore sets the stage for a lifelong love of learning and success. The stage is set, lights, camera, action! These rich experiences must become attached to words in order to foster the development of language in toddlers. Every parent will be delighted to know that tantrums become reduced as language is learned and used. As the adults around them narrate their experiences, the children begin to associate words with their contextual meanings. We know that their receptive language, comes before their expressive language. They understand us even if they cannot yet speak. They usually begin to speak, as we encourage them and use language in fun and meaningful ways. I have had the pleasure of hearing many of the toddlers in my care begin to speak, and sing. It usually starts when we have our gathering time and sing their favorite songs and perform finger plays. We actually do pretty much the same songs and finger plays every day, repetition is the key. Then it progresses to random expressions during play. Helping them “use their words” usually solves conflicts, helps them self-regulate their emotions, and thus contributes to their social and emotional development. Social and emotional development is the most important focus for school readiness and lifelong success. Being a male caregiver and educator has it’s challenges as I am sure you can imagine, but I know that I play a necessary role in the lives of these children. Some of the leaders in the field of child development and early care and learning are men. Jean Piaget laid the foundation for our field, Dr. Brazelton has taught us so much about infants and toddlers, Harvey Karp taught (at least me) how to have the “Happiest Toddler on the Block” and that Bam Bam was the archetype for toddlers, and Dan Hodgins teaches us more appropriate discipline techniques, especially with boys, and “Teacher Tom” Hobson has a great blog about discovery and progressive education. I have plenty of female influences as well, my friend and mentor Lisa Murphy, Galinsky, Skenazy, and Hirsh-Pasek to name a few. I chose this career because of the wonderful childhood I had, knowing that many others suffer in childhood. I chose this because I love watching children grow and learn. I chose this because it is the only thing I am good at. I chose this career because I want a better future for humanity. 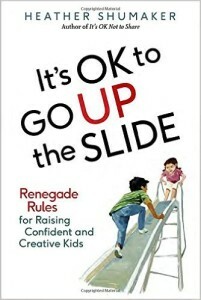 In her book, “It’s OK to Go Up the Slide: Renegade Rules for Raising Confident and Creative Kids”, Heather Shumaker goes so far up the slide that she “boldly goes where no one has gone before”. With boldness and conviction she bucks the trends that are so pervasive in our culture as it pertains to our children. Using modern research, psychology and good old fashioned common sense, she makes a great case for allowing children to experience the freedom and independence of previous generations. She calls for common sense in education reform, the use of modern technology by children, and allowing children to develop their social and emotional selves appropriately. 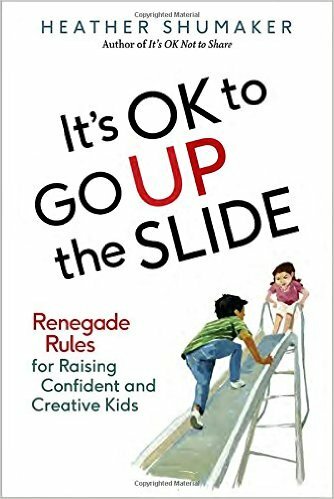 She covers each subject with research, inspiring anecdotes, and wonderful advice about how to handle different situations that may come up as you transition your parenting style to follow her “renegade rules”. In the next section Shumaker takes a common sense approach to limiting technology. She not only suggests limiting your children’s use of technology, but also your own. She makes the case for balanced time with family, distraction free, by restricting your own use of phones and social media, and offers great advice about how to do just that. Shumaker tackles the issues that face our schools today, including a lack of recess, too much homework, and teaching standards that are not developmentally appropriate. When she talks about children having the need for more recess, she quotes the research, explains the developmental needs of children, and advocates for more time in recess. She quotes the Center for Disease Control and Prevention’s definition of recess as “regularly scheduled periods within the elementary school day for unstructured physical activity and play.” She encourages school districts to ban homework for elementary students, and encourages parents to “opt out”. She makes a much needed case for developmentally appropriate, play based kindergarten programs, and more appropriate pre-kindergarten “circle times”. This is something I see as a much needed change, as my work with child care centers has me often addressing “circle time” and its developmentally appropriate use. Shumaker rounds out the book with several chapters about how to help children cope socially and emotionally with the world around them. She speaks to how we can help children navigate bullying in its many forms, deal with their feelings on unfair social issues, disasters, war, and stranger danger. I highly recommend this book! I think that every parent and educator should read it and heed it! We need serious and immediate change in our society as we relate with our children. This book can help to guide us in the right direction. Heather Shumaker gets an A+ for this book! You can get the book here or here. A local childcare center hired me as a Consultant, On-the-Job Trainer, and to fill in as a substitute. Whenever I am not filling in to meet ratio requirements in a classroom I am working hard with the staff and administrators at the center. I started out working first with the Toddler staff. First I conducted classroom observations. 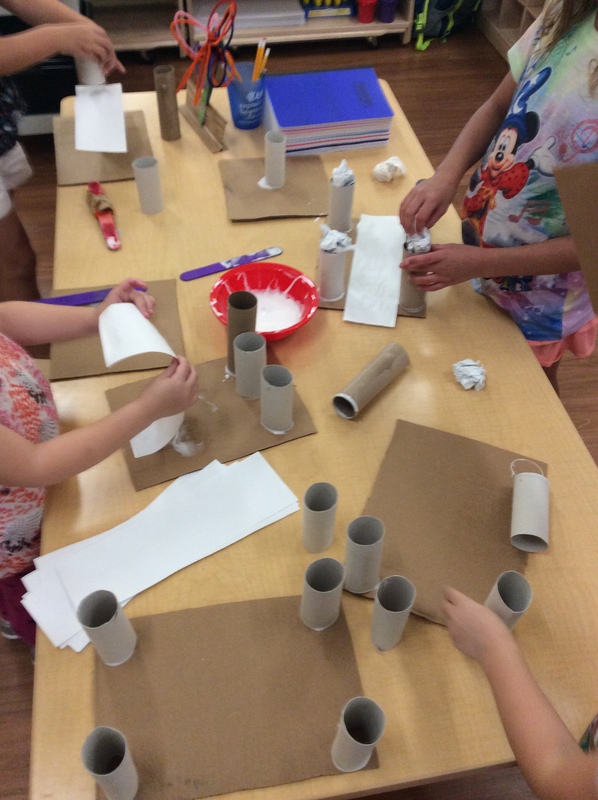 I observed adult/child interactions, circle time, “centers”, art projects in each room and recorded my observations with notes for ideas for improvement. 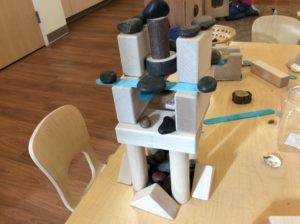 I provided resource articles and other information about Developmentally Appropriate Practice, what children are learning through their various kinds of play, including blocks and loose parts play, and shared some of my favorite finger plays that aim to teach children a variety of skills. I briefly addressed attachment and positive interaction with children. I spoke about how the most important thing is for the children to feel safe, secure and loved. I spoke about how I am glad I don’t hear yelling or a lot of “No!” in their classrooms. I addressed the need for more Sensory play, as that is Developmentally Appropriate Practice (DAP) for toddlers in the sensory/motor phase. 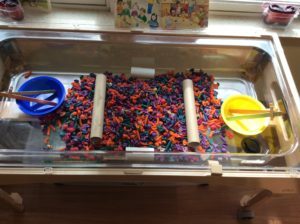 I shopped for and gathered materials so that each room can have a dry sensory bin and tools to use with the corn grain/ birdseed. 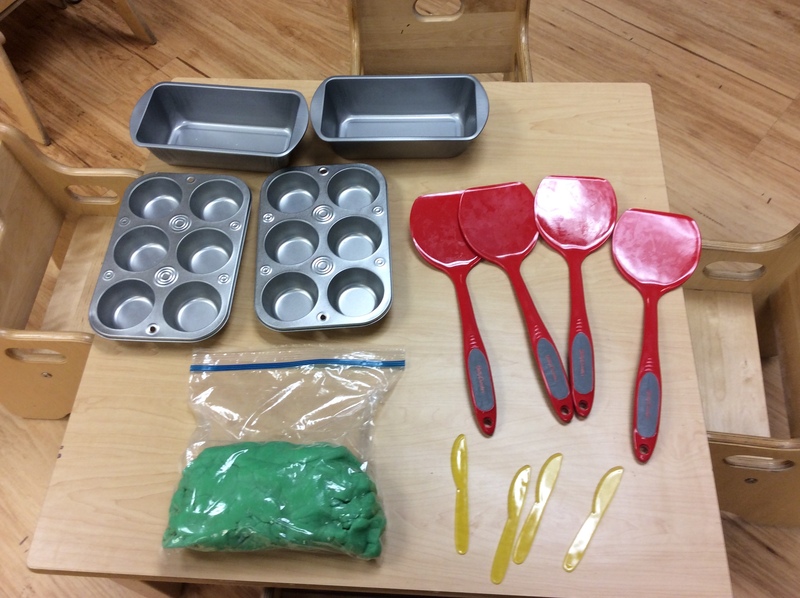 I also made playdoh, and shopped for playdoh tools. 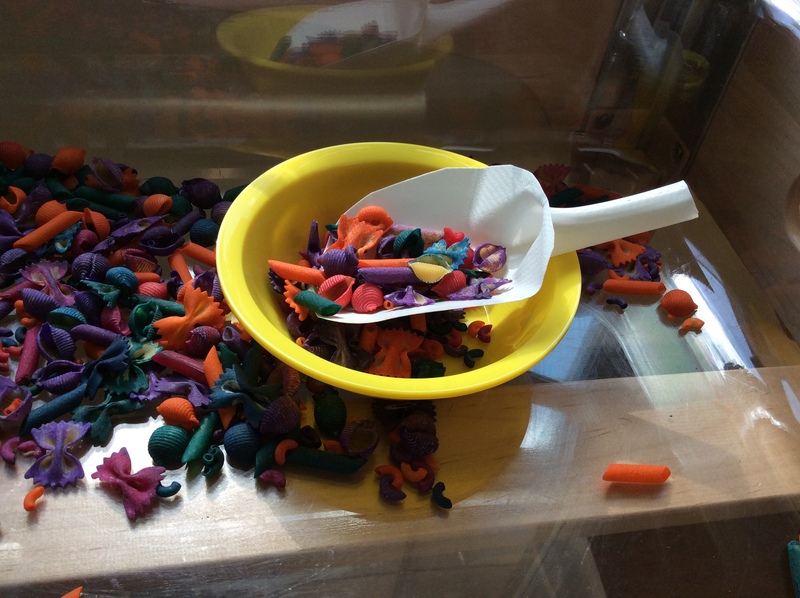 Each toddler class now has a dry sensory bin with tools, and playdoh with tools. 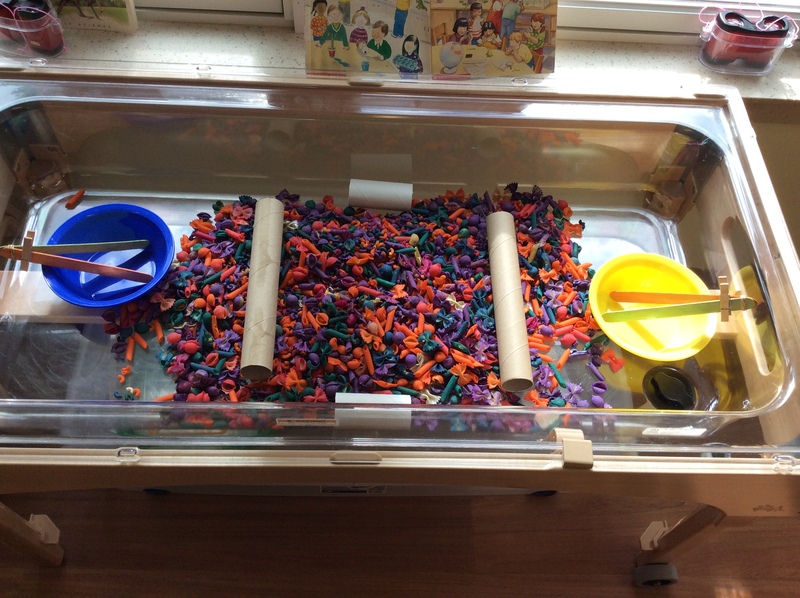 I bought materials and equipped each classroom with a dry goods sensory bin. I cooked playdoh and bought some playdoh tools for each classroom. I addressed circle time issues. I spoke with staff about DAP as it pertains to circle time. I spoke about the toddler’s developmental need for more singing, music, rhythm, rhyme, dancing, and finger plays. I spoke about appropriate books (short books, rhyming books). 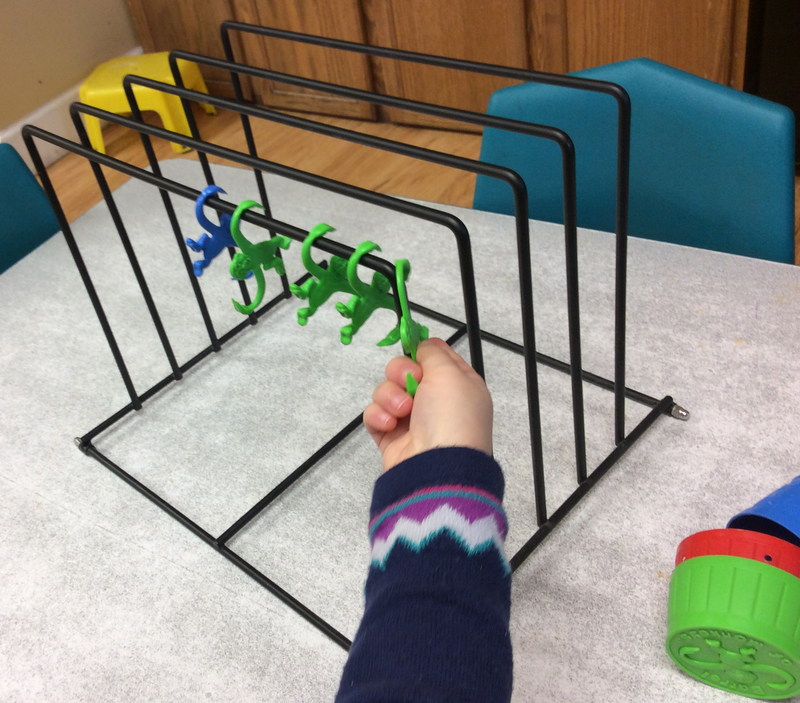 I spoke about finding a way to “teach” number, letter, and color recognition in a more Developmentally Appropriate and playful way. I also “modeled” circle time as well. I addressed the need for more variety of toys in smaller volume. I spoke with the staff about having balls available at all time to redirect children to throw balls instead of toys/blocks. I spoke to them about needing smaller bins of toys, so cleaning up is not overwhelming. I transplanted and sorted toys into “shoe box” sized bins in each classroom. I also gave advice about the design and layout of the classroom, with the wonderful effect of the rooms being re-arranged beautifully in each room. 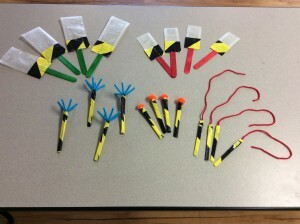 I also equipped the classrooms with other toys and materials that I thought they would need. I addressed the need for “process oriented art”. I spoke about the need for children to do their own art, and if the teacher is taking a lot of time to prepare the project it is not “art”. The children should be able to explore art materials with little to no adult involvement. 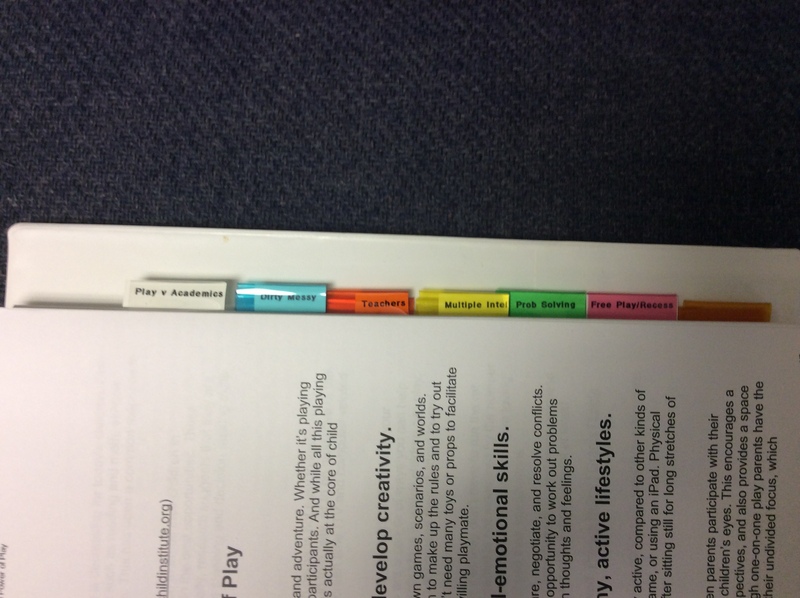 Pathways accreditation wants some kind of art materials available to them at all times. I brought the teachers cardboard, before it went out with the recycling, and said they could have a small box of big chalk and/or big crayons for the children to color on the cardboard, as a means to save paper, while children practice their scribbles. 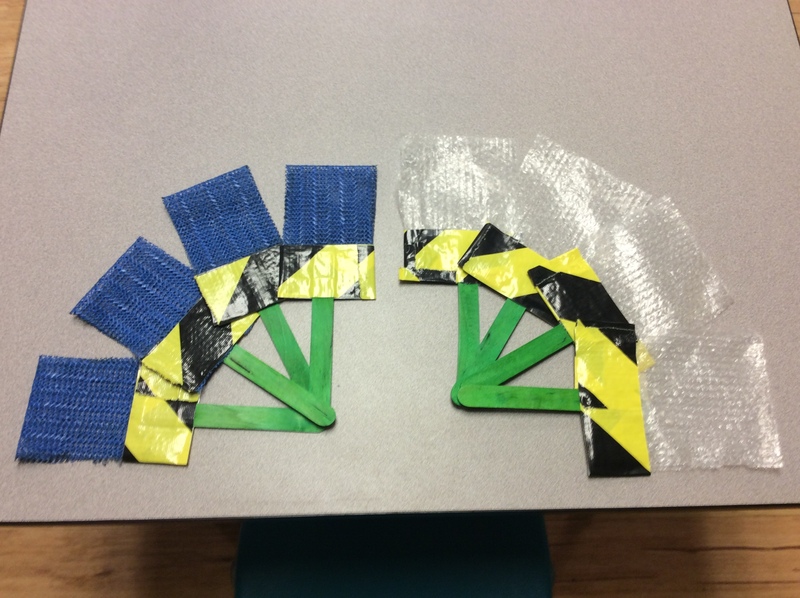 I also made a variety of paint brushes for each classroom. 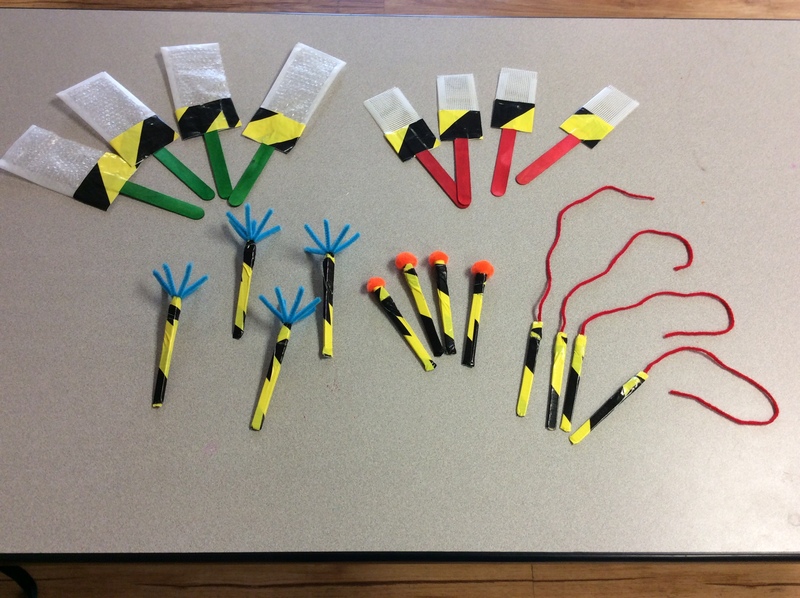 Each classroom received these and more paintbrushes that I made with the center’s materials. The Toddler staff were very receptive and they have successfully implemented these changes! 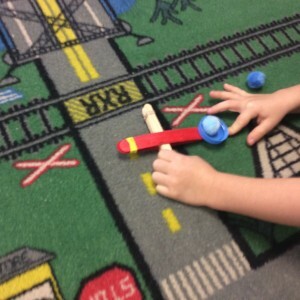 Next I began working with the 3yr old classroom teachers. First I conducted classroom observations. I observed adult/child interactions, circle time, “centers”, art projects in each room and recorded my observations with notes for ideas for improvement. I provided the staff with a form from NAEYC about Developmentally Appropriate-vs-Inappropriate practices with this age group. With that I just “planted a seed”. The next day the Teacher came to me and told me she wanted my help to improve her practice. She chose one area “outside of her comfort zone” to focus on. I counselled her to take baby steps. She decided that she would allow the children to choose freely where they played and for how long. I explained that children need long periods of uninterrupted play that is self initiated and self directed. 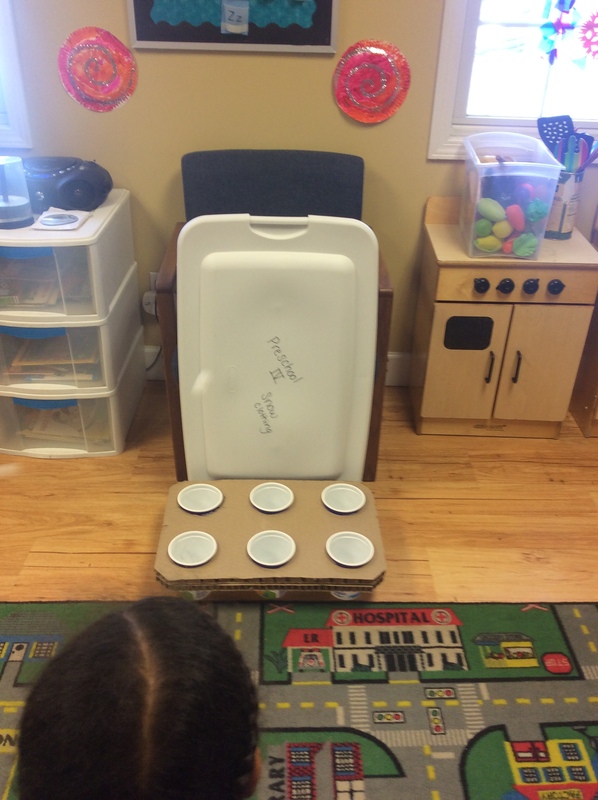 I explained that this process will allow the children more opportunities to practice language and social skills as they negotiate with friends in order to play where they wanted too. She decided to go for it, and allowed the children more freedom to choose. She stopped regulating their choices, and stopped using a timer to have the children change centers. She allowed them to play where they wanted, with whom they wanted, and for as long as they wanted. I was present while she implemented these changes in order to support and guide her when issues came up. I noticed the classroom had a barrel of monkeys and I thought those monkeys should have something to hang on. I found two great things in storage, an old art drying rack and a file organizer, so I brought them into the classroom and the kids loved hanging the monkeys on them. I filled in for two weeks in a 4yr old classroom. I had a great time filling in for a teacher who was on vacation. I wanted to bring a different experience for the children, so I looked for materials and toys to bring with me. I found some things bound for the recycle bin and used them to make a ping pong ball game and some tube ramps for balls, marbles, and cars. I found materials to be recycled, before they made it to the recycle bin and made a ping pong ball game for the kids. 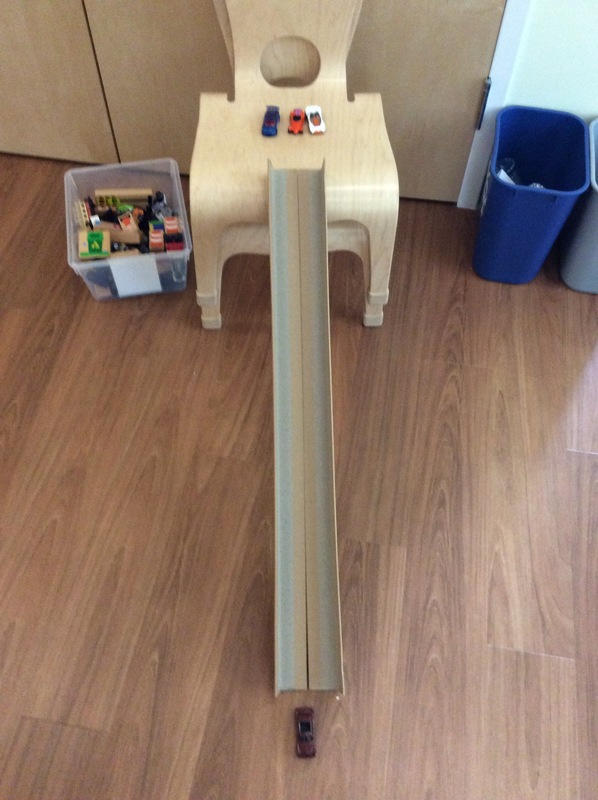 I found more recyclable materials and made this tube ramp for marbles, balls, and cars. 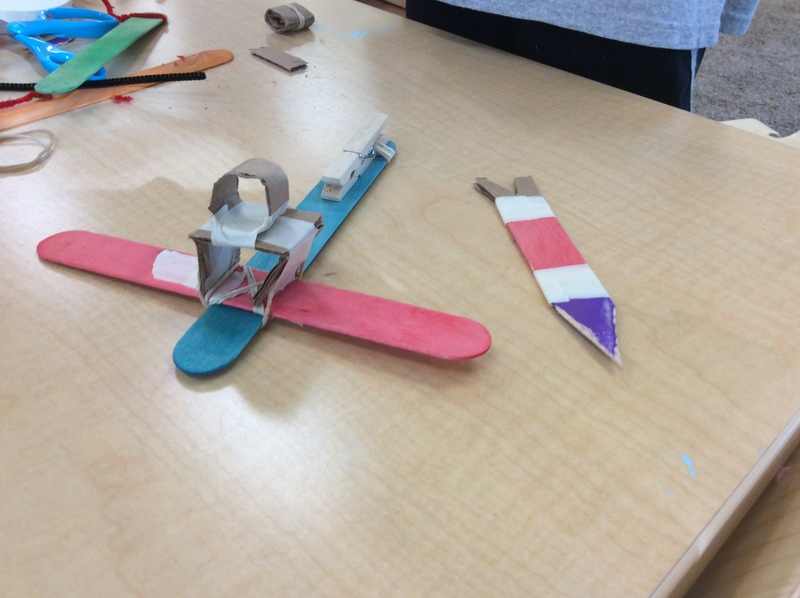 I also made them some catapults, and they loved using them! 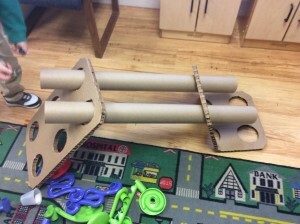 I made catapults for the preschool and school age classrooms. This class also received the paintbrushes and loved the open ended, process oriented art. A painting made with some of the brushes I made for every classroom. 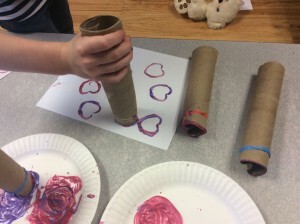 Paper towel tube heart prints. 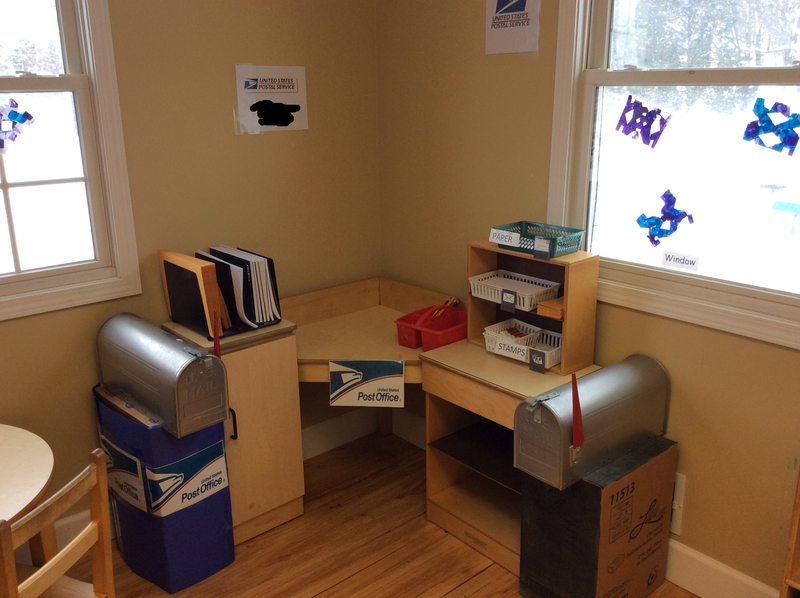 Then I had the pleasure of working with a UPK teacher to make a Dramatic Play/Writing center for her classroom. 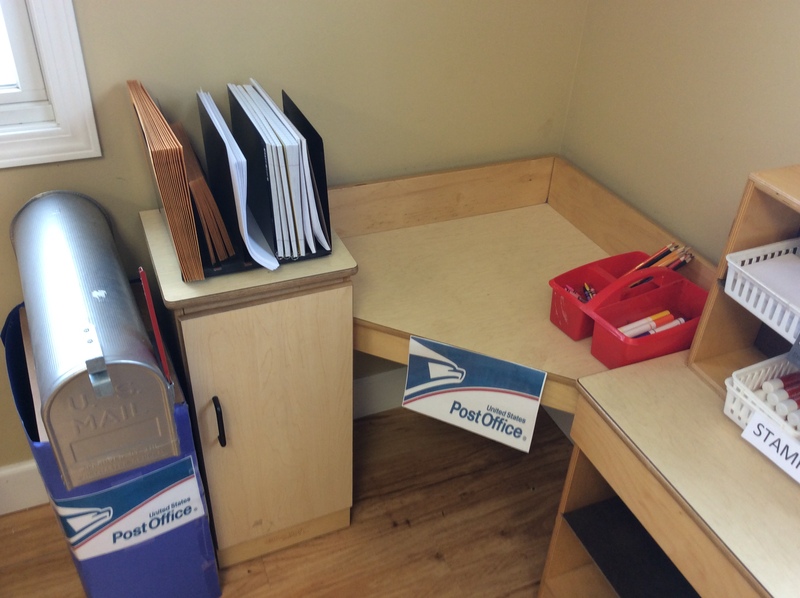 She and I found materials in various storage areas around the center, and made some signs on the computer to make a wonderful “Post Office”. 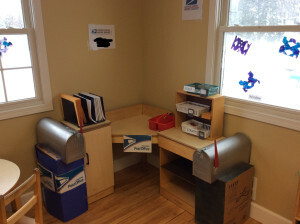 Myself and a UPK teacher found materials in storage, made some signs on the computer, and made a Post Office Dramatic Play/Writing center for her classroom. For the front bulletin board I made some signs about what the children are learning while they are playing. 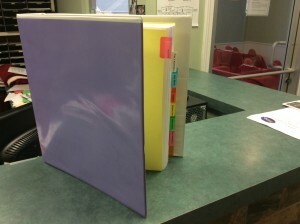 For the front office I compiled resource articles for the teachers and the parents. 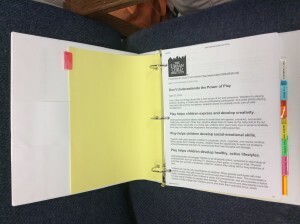 The idea is that when parents ask questions about play and what their children are learning, the staff can copy an article for the parents to read. This helps spread the good news of play based learning! I am currently working with the staff and administration at one of their other locations! This article appears in the Feb./March 2016 issue of “The Wedge” newspaper. The newest article of my regular column for that paper. When I was a pre-teen and teen I loved skateboarding. The rebellion, the attitude, the tricks, all of it! Now as an adult, I appreciate it even more, even though my board is in storage. 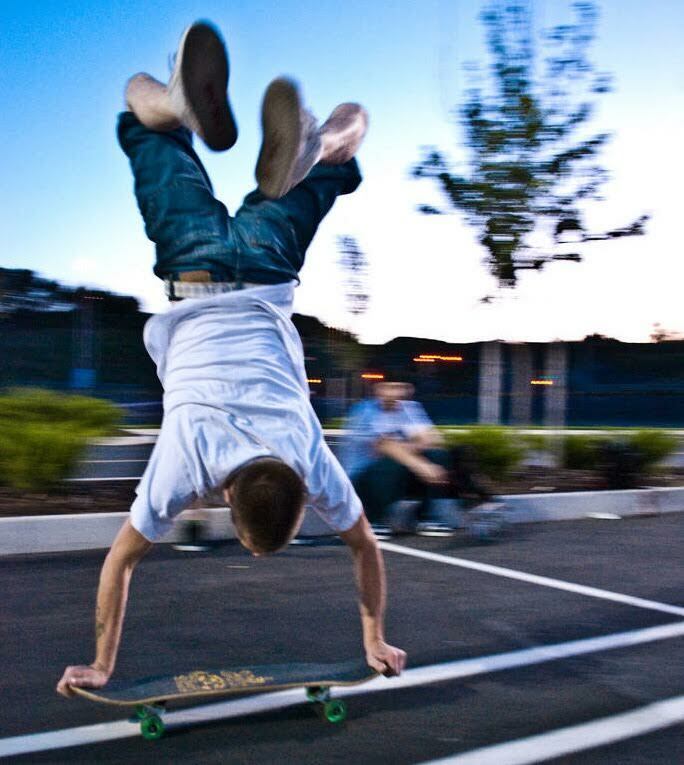 Rodney Mullen is considered the “Godfather” of modern street style skateboarding. He invented upwards of 32 tricks, including the “ollie” that is the foundation for all other street style tricks (which he also mostly invented). Without getting to much into his bio, I will say his father was reluctant to allow him to skate and made him quit a few times, he went to college and studied biochemical engineering, won 34 out of 35 “freestyle” skateboarding competitions by the age of 24, went on to basically invent “street style” skateboarding, became an innovator and inventor creating new skateboard, and accessory designs, became a successful business man and a multimillionaire, and now gives TED talks and has other speaking engagements. He overcame much to get there, search with his name on youtube and see some awesome videos. He has amazing skill, and physical mastery, dexterity and balance! Oh by the way when he was young he wore special boots to bed to help correct a serious pigeon toe condition. The other thing is that if you ever hear him speak you will notice something different about him. There is a lot of speculation on the internet that he may have autism or at the very least aspergers. I am not a big fan of labels, and he has never said anything public about it, but many people that have had experience with others or they themselves are “on the spectrum”, seem to agree he seems to have many of the “symptoms”. I believe that if he were a generation younger he may have had the diagnosis early on in his life. But then again so would Albert Einstein. 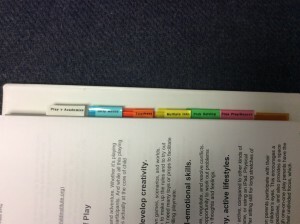 A large part of me has an aversion to these types of labels. For one, our society and it’s schooling system, want’s to cram all of us uniquely shaped “pegs into round holes”. Second, those labels usually come with a bunch of grant money so there is a lot of incentive to label people. Another part of me understands the labels because then we have more awareness and hopefully compassion for others, and may be able to help people more effectively. One thing I do know for sure…all children have a hidden genius inside of them. I am coming to believe more and more that so called “disorders” like autism are really just labels to help us understand the way someone other than ourselves, or the perceived majority, thinks and functions socially. I am sure there are many success stories like Mullen’s out there and I truly believe there could be many more. Many educators are familiar with his theory, but I believe that if we really implemented it in our practice we would see every child be successful. Like Rodney Mullen, if we allow our children to play, experiment, and explore, find their passion, and encourage them to pursue their own interests we would also see our children succeed. Let your children play. Let them follow their own passions, interests, and dreams. Find their specific intelligence and gifts. Encourage their pursuits. You will see them find success and fulfillment. You will have released their “Hidden Genius”! This past week we in the field of Early Childhood Education lost one of our heroes, Bev Bos. 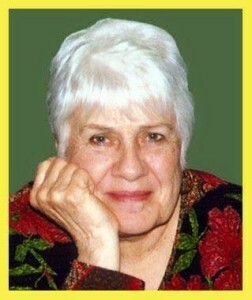 For over 40 years she advocated for and educated young children through hands on play and discovery. She passed away on February 4th. To many of us she was an inspiring leader, a passionate educator, a fellow advocate, and someone we aspired to emulate. She spoke the truth in love! In love of children, in love of society, in love of education, in love of humanity. Her truth is something that we have been spreading, hoping that it takes hold in every early learning environment. At the end, and I hope you took the time to watch it all, she insists that she is right. Well guess what, she is! Now 25 years later we have a growing body of evidence that proves that her understanding of how children learn, grow, and develop, is spot on. She devoted her life to this message! The pessimist in me wonders how she felt near the end of her journey, as it seems that things have only gotten worse in early childhood education. That her message failed to influence the right people. The optimist in me celebrates her life and passion and sees a rather large community of educators coming together to make her message, and now our message, heard. The realist in me sees that we have our work cut out for us and we have a long way to go. Progressive Early Learning is devoted to this message! Children grow and learn best, when they are allowed to play, when they are allowed to direct their own learning, when they are allowed to explore and discover. 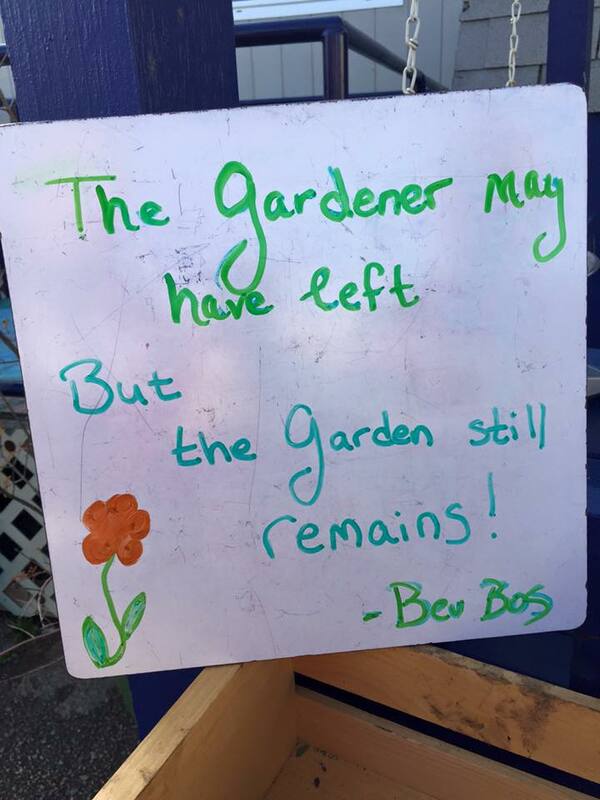 We look forward to being one of many voices to proclaim this message, and to continue the work of “the Gardener” Bev Bos!